Oxford University Brass Band is one of Oxford’s most active and inclusive student music ensembles. This year the group has made three TV appearances appearing on channel 4’s infamous show “Made in Chelsea”, on BBC “Look South” during the Oxford’s Lantern Parade and finally we were featured on local TV earlier this year as we prepared for the university brass band championships. 2016 marks the 10th year of OUBB and the 70th anniversary of the Oxford-Leiden relationship. The longest Anglo-Dutch link in existence, formed in 1946 to promote international cohesion between two countries suffering from the aftermath of the Second World War. Town-twinning has always been a big part of my life, indeed my grandmother was one of the founders of the Todmorden-Roncq association – an Anglo-Franco partnership that flourishes to this day in my Yorkshire home town. Music should be an international activity, and so I decided that my final act of President of the Band would be to take OUBB on a whistle-stop tour of Europe. Our first stop was on the shores of England. For two days and nights we were hosted by the Castle Inn, a listed building with much history claiming to be every Spitfire Pilot’s favorite bar in 1940. Sadly it seemed that the furnishings hadn’t been updated since! Still our hosts were very hospitable and during the day the bar would be transformed into a rehearsal venue and by night the shutters would open and the beer and spirits would flow. Dover itself is quite a troubled little town, battered by the wind and sea, and the repercussion of the closure of the mines can be witnessed still today. Yet its history is rich, its castle stands proud and its pebbled beaches are clean and empty. Negotiating the Euros 2016 traffic, we made our first trip to the Hague in the Netherlands. Den Haag, the country’s third city, is famous for its cyclists, canals and court. Interestingly, although it isn’t the country’s capital, it does house the national parliament. Den Haag served as a wonderful base from which we could journey to our concert venues. Harderwijk by the seaside some 90 minutes North-East of the Hague, is a lovely fisherman’s town. Quaint shops selling Dutch cheese, artisan crafts and other local produce decorated the winding streets. OUBB set up for our first concert outside the city hall in front of a number of cafés which provided both a captive and an appreciative audience. 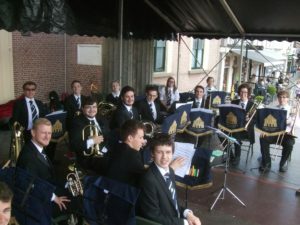 Our performance was to celebrate Veteran’s day and we performed alongside a group from Leiden called the “Band of Liberation”, a rather niche musical group that dresses up in WW2 military regalia and deliver music from the war era. The following day we came together again with the “Band of Liberation” in Leiden’s Town Centre beside a locally famous public house, situated at the base of remains of the city’s oldest castle the “Burcht van Leiden”. The heat did not give out whilst we played and our sonorous tones could be heard up in the castle on the mound and beyond. Leiden houses the Netherlands oldest university founded in 1575, some 300 years after Oxford University, and has a very pedestrian friendly centre. Live music accompanies floating restaurants and ample bridges connect the many banks of the canals. Pleasant eateries and continental diners entice tourists and locals alike with their eclectic array of cuisines. Pleasant eateries and continental diners entice tourists and locals alike with their eclectic array of cuisines. 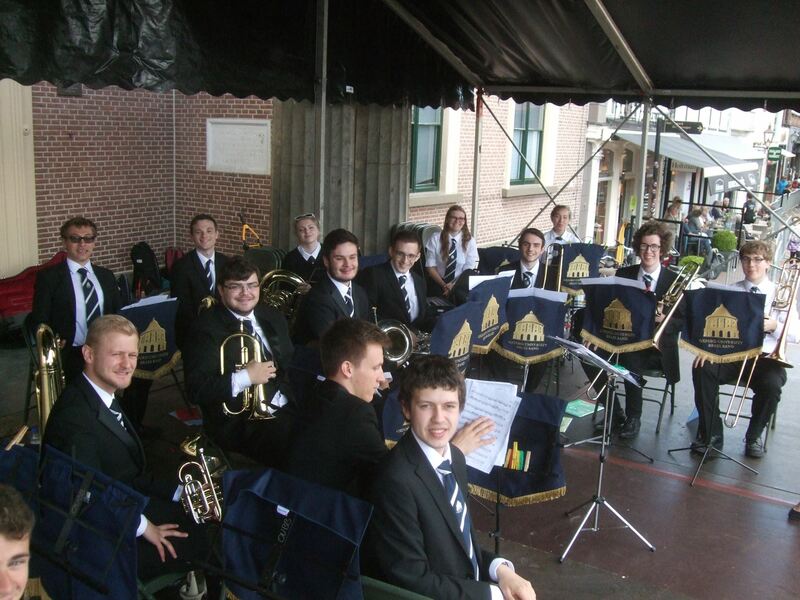 On our final day in the Netherlands we performed in front of a magnificent hotel in the seaside resort town of Schwenningen just a few miles outside Den Haag. The sun beat down on us relentlessly as we played through our animal-themed repertoire which included a few movements from Saint-Saens Carnival of the Animals, a rendition of Nelly the Elephant” featuring our tuba section and “Kraken” a jazzy piece which brings to life a sassy female stray cat. Germany was our next host country and Cologne the city. As is the case with many European cities, the tight backstreets, do not provide easy coach access and so after several close shaves with lampposts, we decided the best drop off point was the Cathedral some 2 miles walk from our hostel. And so every morning and evening Oxford University Brass Band became the Oxford University Marching Band as we paraded somewhat sluggishly with instruments, cases and music through the bustling centre of Cologne. The Cathedral dominates the city and can be seen from miles away. The Cathedral, completed in 1880, is Germany’s most visited landmark attracting 20,000 people today. It is also the 3rd tallest place of Christian worship in the world and was for 4 years the world’s tallest building too. Up close, when you lift your head to the heavens, you feel a weird phenomenon known as reverse vertigo, where the perspective gives you a real sense as if you’re falling, albeit upwards! Cologne is situated on both sides of the Rhine, but if you travel 140km upstream, you leave the industrial centre to arrive in the UNESCO world heritage site between Goarhausen and Koblenz. Here, picturesque towns have been built, where typical Gothic German architecture is hemmed in between the banks of the river and the steep sided valley. The band enjoyed a short boat trip along a stretch of the Rhine that includes the world famous Lorelei rock, known for claiming many lives of unweary sailors in centuries past. According to folklore, a very attractive young mermaid would sit invitingly on the edge of the rock, tempting sailors ever closer in with their boats. Many would fall victim to the unseen rocky outcrops lying just beyond sight under the Rhine’s ripples as the mermaid watched on impassively. A very German Biergarten hosted us that afternoon as we gave a concert to very content customers. Especially popular was our Fantasia on British Sea Songs. The piece was originally composed for orchestra in 1906 by Sir Henry Wood, it has since been made famous by being a regular at the last night of the Proms. Denis Wright then re-orchestrated it for brass some years ago and the Sailor’s Hornpipe and finale with Land of Hope and Glory really do encourage audience participation especially after a couple of pints. The following morning we learned that overnight, our coach had been broken into. Fortunately the coach was left largely empty and all our instruments and music were safely with us in the hostel. Still the broken door left us without coach transport to Bonn, Oxford’s German twin city. Bonn lies only 30km south of Cologne, so we made extensive use of the region’s expert transport links to take a tram all the way there. We met up with some very friendly council officials who looked after us very well and showed us to the city square. Another fantastic concert venue and this time our rendition of Handel’s “Music for the Royal Fireworks” was quite the show stopper. German-born Handel spent much of his time in England, although his Anglo-German connection is some 300 years older than our own. A further musical connection with our twin city, and also its most visited museum is “Beethovenhaus”, Ludwig van Beethoven’s birthplace a charming town house which now serves as a small concert hall by night. Bonn, is also a bustling university city and around the old town hall a farmer’s market was in full swing offering a delightful assortment of cold meats, quirky cheeses and natural honey. Although the student term had long since ended, a large number of students had descended on an empty shop dwelling nearby in protest of the increasing urbanization being imposed on Bonn’s historic centre. Stockenstrasse, where the sit in protest was held is a slightly rundown street. Still home to an eclectic mixture of businesses just off the town square, it is due to be knocked down and replaced with yet another homogenous shopping centre. As the short term leases are coming to an end, the owner is refusing to reissue them and so the number of empty lots is steadily increasing. Our final concert abroad was on the way back home to Calais. Valenciennes a small town situated in the départment du Nord in France, was almost completely destroyed by the second world war after being abandoned, looted and then occupied. Now it is today rather a hidden gem with lengthy boulevards decorated with water features and a surfeit of inviting cafes and restaurants. Our concert was on the same afternoon of the French-German semi final in the Euros, so much of the town was quiet as football enthusiasts became glued to their TV screens. Still we afforded a modest and ultimately appreciative audience in the bandstand just next to the Musée de Beaux Arts and a couple of friends from my home town’s twin town, Roncq, were able to come and listen. The tour ended back in Oxford with a joint performance in Oxford town hall where we played alongside the K&G band from Leiden. All in all we had a very successful tour and hopefully in a few years time, the university brass band’s European ties will be even stronger. Despite the backdrop of Brexit this Summer, we all felt very welcomed into our sister cities. In spite of whatever may be going on in Westminster of late, it is comforting to know that individuals and societies can flourish internationally.